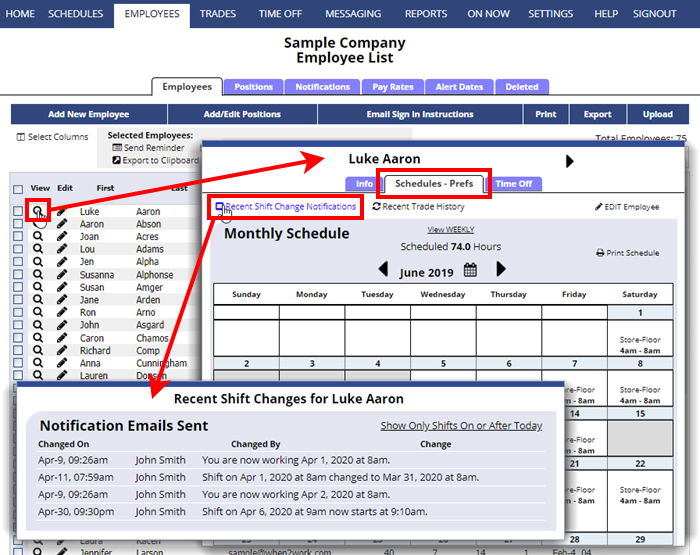 If an employee’s notifications are set to email them when any of their published shift assignments change, and you have set to send notifications when a published shift is changed, then any affected employee will be emailed about their shift changes. When these notices are sent, it will change the status icon on the By Employee and Statistics views – you will see an envelope icon indicating the latest schedule was emailed to them or an envelope with a checkmark if they clicked on that email link to confirm receipt. You also can track the recent shift change notifications that were sent to an employee on their View Employee Details page on the Schedules/Preferences tab.